This is a story that may seem a little odd to you to fit the “pay it forward” concept, and while it can certainly be thought of as good karma, upon reading it, perhaps your perception will be different. That being kind to someone, by thinking of anyone but yourself, by doing something seemingly small and insignificant, it will come back to you many times over! Earlier this week, Tuesday the 31st of May, my sister remarked that the air purifier I bought for her at Target a few months back simply quit working. No explanation why. It just quit. She found the box in her garage that it came in when I bought it, had placed the purifier in it, and set it outside on her patio. So, I asked, “What do you think we should do?” She said, “Well, you could probably just take it back to Target, maybe they’ll give you store credit for it.” I hadn’t the first clue what “store credit” meant, all I knew was the sales receipt was long gone, tossed away in the trash months before. I figured the $99.99 I spent to help my sister out was pretty much a decomposing receipt buried in some landfill in northern San Diego County. Me being me, that is the NEW me, the one who says “never say never”, the same guy who used to look at his life’s cup as half-empty, said “Well, it’s worth a try anyway.” So off I went. Here’s where the funny part starts and it didn’t end until I left Target, leaving 4 or 5 employees laughing hysterically, including yours truly, all the way back to my sister’s house with a new air purifier in tow, extra filters, and two bags of pistachios! Upon arrival at the local Target store in Encinitas, CA., which by the way is going under some major remodeling, with scores of workers scurrying around both in and OUTSIDE the store, finding a parking spot looked to be a tall task. I decided, unlike everybody else who was trying to get the closest spot they could get, to simply take the first one I saw, in spite of the long walk ahead. As I walk in, lugging this big box in my arms and finding the customer service counter, I reach for my wallet and….ooops, left it in my vehicle. Not a good sign. So, I tell the clerk, actually I said, “Lucia? I have this air purifier I bought for my sister in your store a few months back but don’t have the receipt. It just quit working. Can I get store credit?” She says, “We need your I.D. to process your request.” I said, “Okay, I’ll just leave the box here and be right back.” Think again! She says, “Nope, can’t allow you to leave it here. You’ll have to take it with you.” So, I go back outside to retrieve my wallet. By this time I’m sorry I didn’t take the time to find a closer parking spot because that box was getting awfully heavy. Now I’m back. There’s Lucia again. I hand her my I.D. “Did you buy this over 90 days ago”, she asks? I didn’t hesitate. “Why, yes. In fact it’s been several MONTHS.” “Oh, well our policy is for anything over 90 days old without a receipt, all we can do is allow you to exchange it for ANY OTHER items in the same department you bought it in, but they HAVE to total AT LEAST $99.99. We can only give you 80% credit for what you paid for it, which was $124.99.” Turns out that “department” was sporting goods. At this point of the story, let me share with you what I think MOST people would have done in my position. FIRST, they would have said the item was bought within the past 90 days, thinking they could get a better “deal” with the store. But, more importantly, I think most people who, after finding out they could buy ANYTHING in sporting goods that totaled $99.99, would have opted for anything other than ANOTHER air purifier. After all, my sister wasn’t all that thrilled with it to begin with, since it WAS taking up a lot of space on her dresser. In fact, when I came back with the new one later, she said, “You didn’t HAVE to do that. You could have bought something else.” Maybe she meant for my-self, which is what I think most people would have done. Not me. So, now I go off searching for sporting goods, which just SO happened to be CLEAR on the other side of the store! Fortunately, I’ve got the useless one in a cart now instead of lugging it around by hand. The clerk told me I STILL couldn’t leave it with her, to bring it back with whatever I bought, and someone would tend to my needs. As I’m strolling along, the thought DID occur, “You know, I could use some new shoes, maybe even a basketball, or some beach towels.” I banished it quickly. And there I stood in front of a shelf of air purifiers, one of which is the same EXACT one I’d already bought. No way, I thought. She didn’t like it to begin with. Instead, I see a smaller one for $74.99, just the right size. Still 25 bucks to go I thought. Right above it, I see a set of replacement filters for $44.99. Bingo! All I have to come up with is the difference, about $30 before tax, all because I was trying to be KIND to my sister. I thought nothing of what I could have gotten for my-self. As I march proudly up to the service desk, there’s Lucia again. She forms a cross with her fingers, she knows I’m already out of breath from running out to get my wallet, running all over Target, and just ready to get this ordeal over with, though by no means was I upset. In fact, I looked at it as just another adventure. Smiling, she rings it up. “Problem”, she says. “What” I exclaimed!? “You still have to spend another $5.98”, she says. Turns out the air purifier I had bought in place of the useless one just “happened” to be on sale that day for $49.50!! By now, she’s feeling sympathetic to my plight, knowing I’ve just trudged all over their store, dodging worker-bees, all so I can find a silly air purifier. So, she points over to the food section, not 50 feet away, and says, “If you go over there and get something that costs AT LEAST $5.98, even though it’s not “sporting goods”, I’ll have my manager give me an over-ride code so you can go on your way. “Deal!” I said with a smile on my face while we both started laughing. Of course, you can probably surmise what happened next. 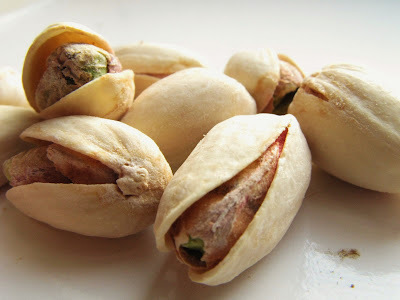 I come back with a SECOND bag of Planter’s pistachios knowing that this entire ordeal was over and there stands not only Lucia, with tears rolling down her cheeks in laughter, but also FOUR other Target employees, INCLUDING the store manager, all laughing hysterically. As she FINALLY rings me up, in which I STILL owed $2.02, she looked at me as if I had just made her day, maybe her entire week of tending a thankless job as a customer service clerk at Target. Happy to provide you some comedy relief! God knows we all need it from time to time. Every time I buy pistachios now, I'll think of the look on Lucia the Target Store clerk's face!